This morning's camp break featured heavily in the large bug department. It is remarkable how my attitude towards insects has changed since we left home. I used to recoil at the sight of a large "scary" bug. Now my instinct is immediately to find the camera and get as close as possible. Bugs, especially large ones are so gross/cool/awesome! 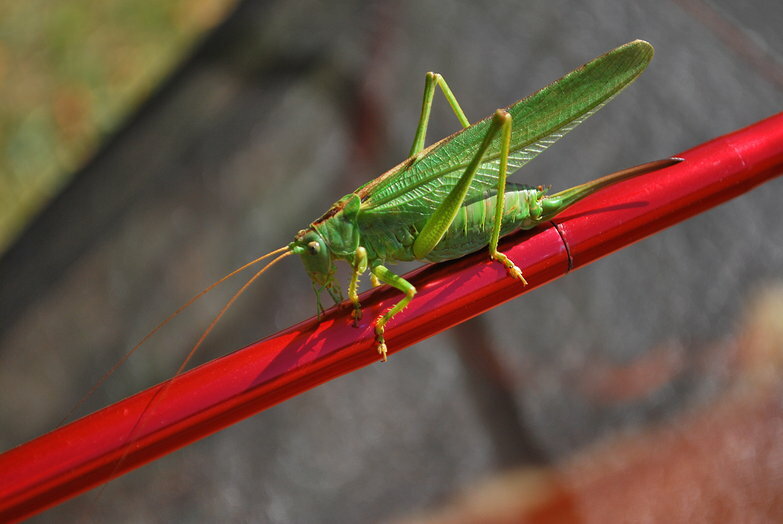 As I was taking photos of it, the katydid jumped off the tent and made a bee-line for Tara who was turned away and couldn't see it coming! I managed to warn her just in time, but she still screamed when she felt the bug smack into her back and cling to her tank top. Just as we were leaving I almost had a head-on collision with the biggest dragonfly I've ever seen. Phew. Bugs everywhere! The rest of the morning was spent sitting around while I attended to a minor disaster with a colocated server at home (the one hosting our website no less!). Thankfully, we got everything sorted without too much trouble. What followed was a short 40km sprint to Camping le Soleil Fruite our third Dutch-filled campsite in a row. If I didn't know better I'd say we somehow teleported to the Netherlands. The ride was entirely uneventful save for the last 2km which followed a huge apricot grove. The trees were growing an arm's reach from the road! We may have borrowed a few :). It was our intention to take a rest day but when we arrived we found the campsite absolutely packed. We were lucky enough to get a pitch in a small clearing but it provided absolutely no shade. With the sun beating down on our camp we decided to continue our trek north to Chalon-Sur-Saône tomorrow, hopefully making some real distance. 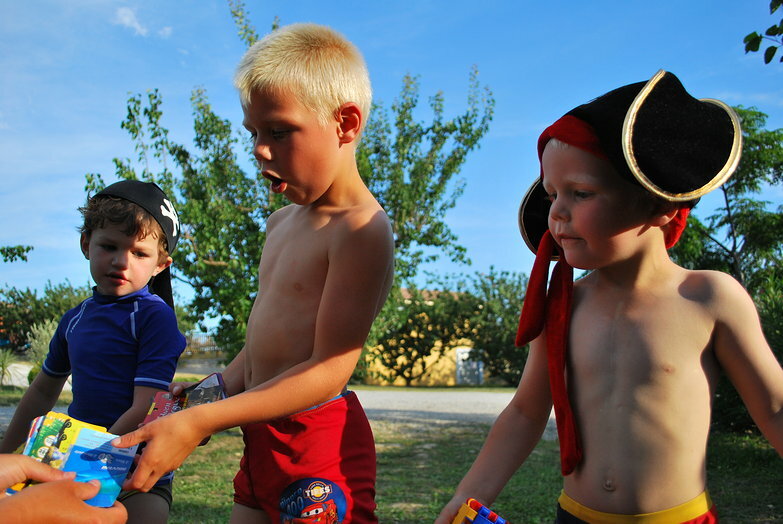 While making dinner, three young boys in pirate outfits complete with blocky swords ran over to our tent to say 'hoy'. We returned their sudden Dutch hello with a friendly English "Hi" and did our best to exchange names. They were Mika, Toma, and Dane, and they didn't even seem to notice that we weren't speaking the same language. With introductions out of the way we proceeded to have a hilariously informative conversation about Mika's card collection. French campsites often have playing-card sized brochures highlighting information about the areas' tourist attractions. Mika had obviously collected at least one of each from several different campsites, and sometimes five or six of the cards he really liked. The dinosaur amusement park and pirate museum were featured heavily in his stack, and the race track held up a close third. We listened patiently as he gave us the low down on each card, all of them hollering "PIRATES" for each pirate card he dealt. Toma and Dane eventually got impatient with all of this talk and began swinging their swords menacingly at us. Then suddenly, all three of them ran away, just as abruptly as they had come. After laughing hysterically about our encounter, we finished the day with our chicken-curry-in-a-can dinner and settled in to watch a few episodes of Lost. A short but eventful day! We got a chuckle out of the Terminix ad which appeared on the side of your post today! I guess they don't share your keen interest in large bugs. Glad the server is back up. We did notice for a couple hours we couldn't access your site. 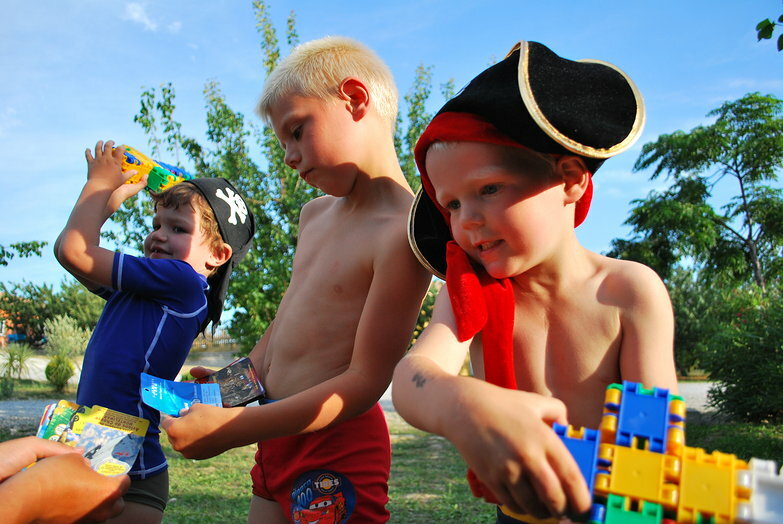 I love the pouting look on the face of the boy in the pirate hat, right before he got bored and started attacking you with the sword! 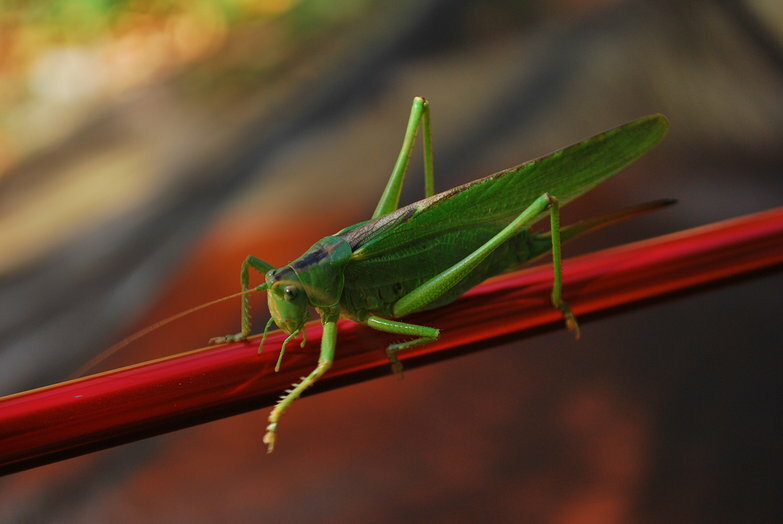 The first big grasshopper is a katydid. 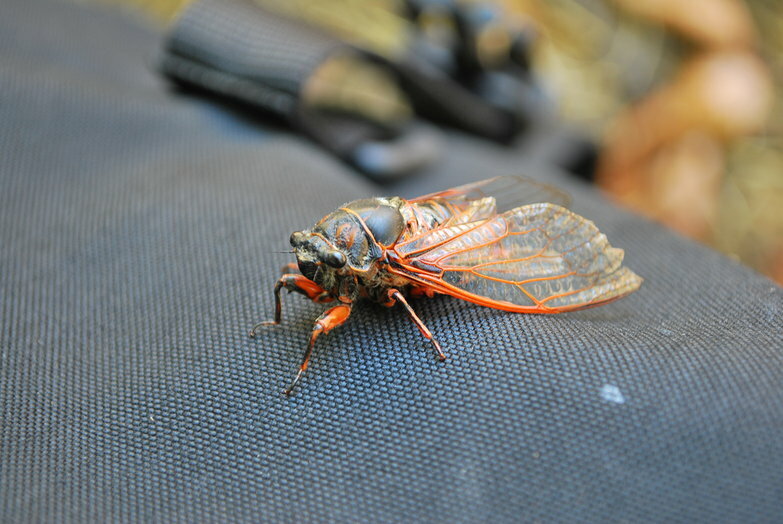 The second insect is a locust. They spend most of their lives as nymphs underground. After 13 or 17 years, depending upon which type the insect is, they come to the surface, molt, mate and then die They don't even have mouth parts as they don't live long enough to eat. Thanks Joyce, we fixed the journal entry and photos! Can't believe they don't even have mouths! Hey you, we just finished reading through your blog while sitting in a hotel room waiting for spare parts for Yves moto. Yes, we've got adventures too. As he wanted to check the air in the rear tire, the valve broke. But the SOS service of BMW is great. Just a phone call and 20 min. later we were already loading the moto on a truck who drove us to a nearby garage. We will get it back this afternoon. While getting stuck in Brest I grabbed the chance to go to the hospital to get a treatment from the dentist. Now everything is fine and we will take off tomorrow again. It was kind of funny as we read your going to get Therm-A-Rest :) And we suffered with you as you went trough the nightmare of needing a doctor in the middle of the night. We know exactly what that means. We hope your trip is going well, and that your troubles are over! We think of you all the time, and have read quite a few of your journal posts translated into English.